Conditions evaluate to true/false, and then branch into the Workflow based on a set of rules. These can be grouped using AND/OR logic. 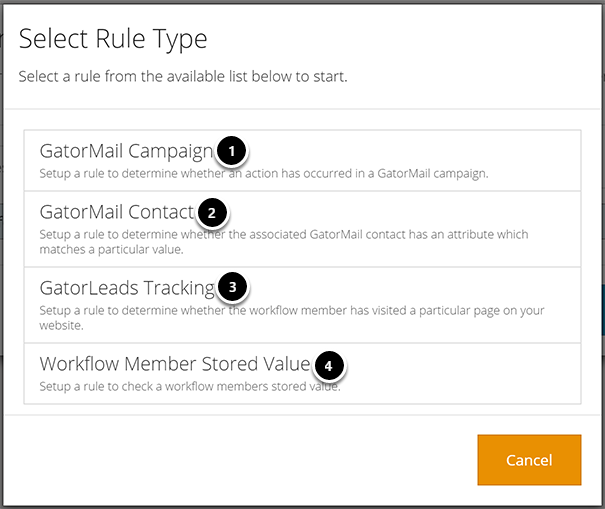 Rule Types allow you to base your condition on GatorMail Actions, Contact Values, GatorLeads Tracking or Stored Values. The rules can be evaluated as soon as the Workflow member enters the stage, periodically until a wait period has elapsed (the same wait options as 'Wait' stage), or the condition evaluates to true (whichever comes first). The below screen appears on dragging the stage to the canvas. Choose when the rule should be run. 1. Select the plus sign to add a rule. There are four rule types available to use. A GatorMail Campaign rule determines whether a Workflow member has performed an action in one or more GatorMail campaigns within a Workflow. 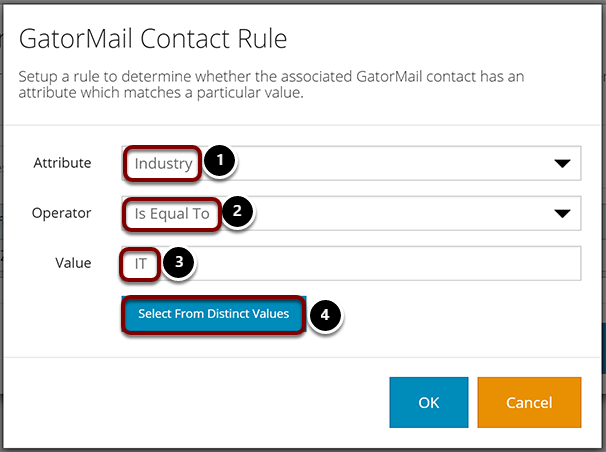 A GatorMail Contact rule determines whether a Workflow members associated GatorMail contact has an attribute which matches a particular value. 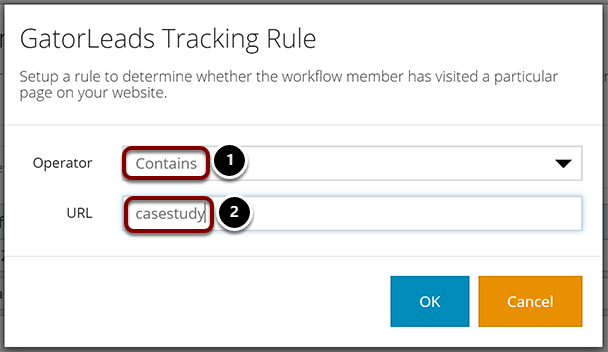 A GatorLeads tracking rule determines whether a Workflow member has visited a particular page on a web site. 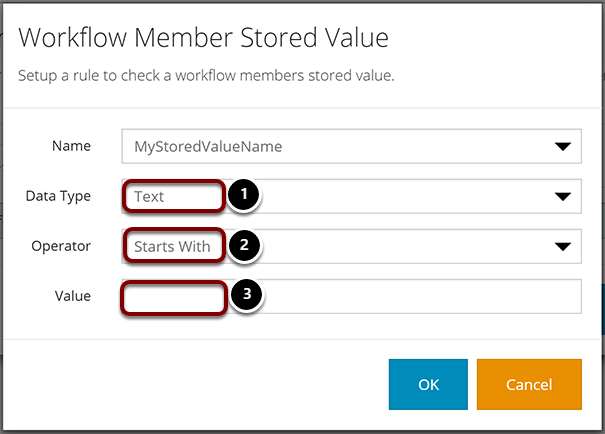 A Workflow Member Stored Value rule determines whether a stored value matches a particular value. GatorMail Campaign rule types determine whether an action has been carried out or not within GatorMail campaigns. Any campaigns (in the current workflow) - Allows you to query a certain action within any campaign that exists in the current Workflow. Single campaign - Allows you to query a certain action within a specified campaign that exists in the current Workflow. Current campaign in a journey - Allows you to query a certain action within the current campaign that a member has received within a Campaign Journey. Any campaign in a journey - Allows you to query a certain action within any campaign that a member has received within a Campaign Journey. Stored value campaign - Allows you to query actions carried out within a campaign where the campaign was sent by using the id within a stored value. All types require specifying the action to query. The options are presented following making your selection. 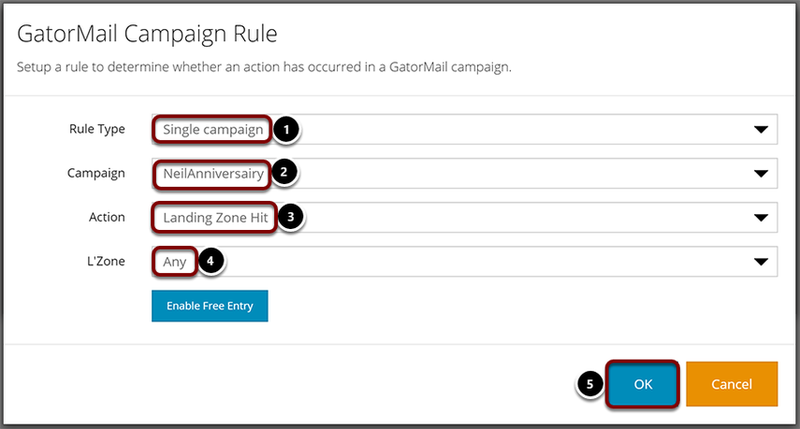 The above example shows a GatorMail Campaign Rule based on a single campaign that exists in the Workflow. This allows you to check and evaluate the value stored in a contact field. Apply the value to match your operator. There is the option to 'Select From Distinct Values' which will allow you to choose from a data list, the values that exist in the field. Otherwise you type directly into the 'Value' field. This will check if a member has hit a particular page on your website or any page on your website that's URL contains a particular string (if you have GatorLeads tracking installed) since they became of member of the current Workflow. Select your operator (Contains or Is Equal To). Specify the value to search for (full url for 'is equal to' or a word or string if using 'contains'). 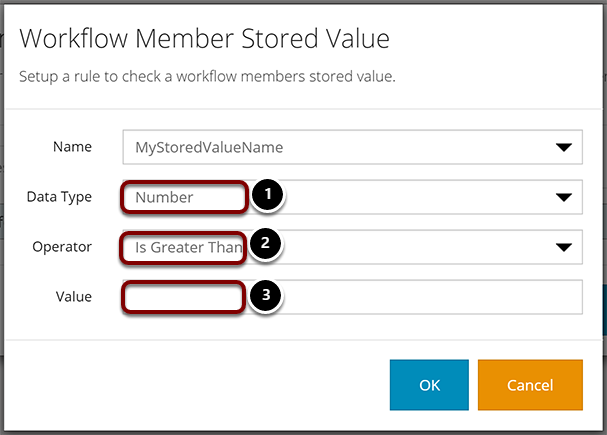 Allows you to perform a check on the value stored in a Member Stored Value field. Does it hold a date that is before or after another date? Does it hold some text that matches part of a string? Does it hold a number that is less than, equal to or greater than another number? 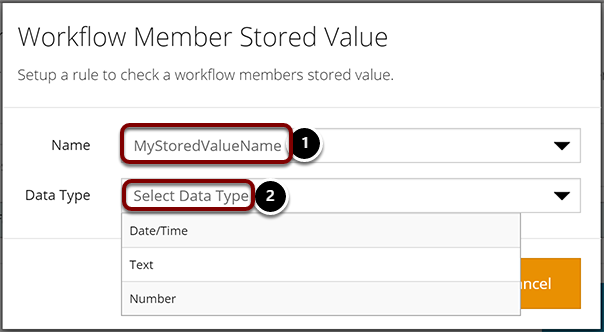 Select the correct data type of the stored value (what type of data does it hold) This is required in order to give you the correct query options. 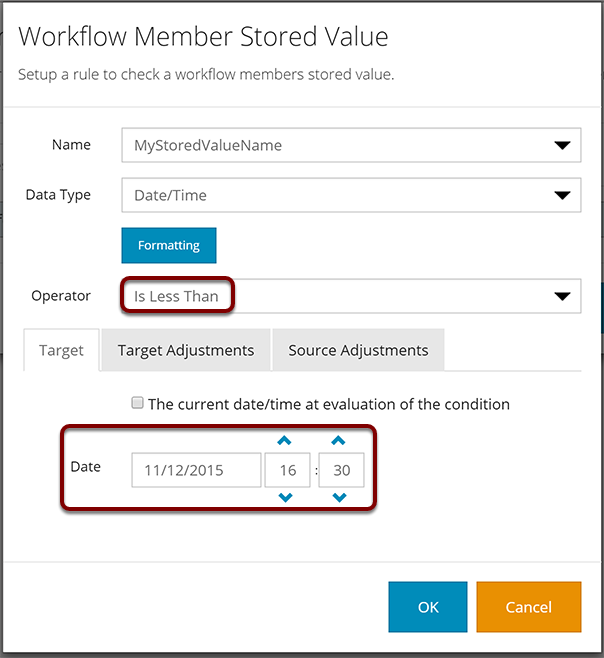 If your Stored Value contains a date, you're able to query the value or an adjustment of the value in multiple ways. 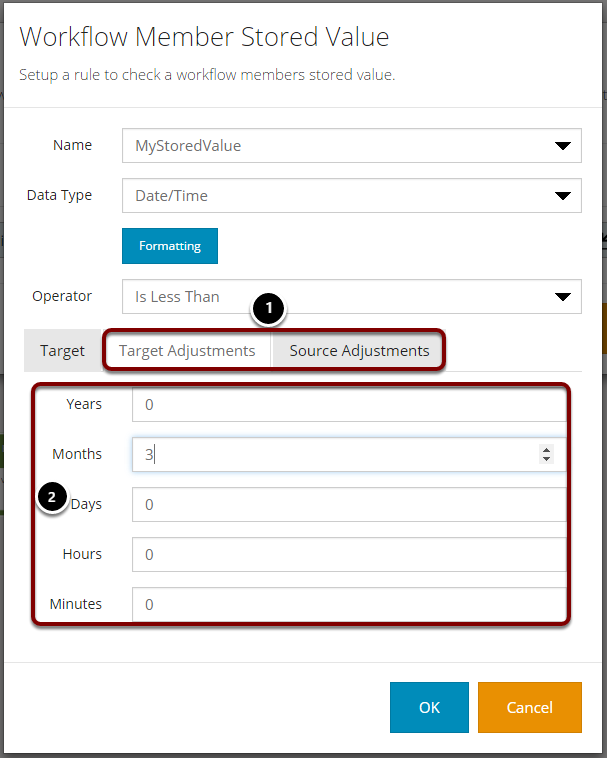 You can base your calculations on a user specified date (Target) with potential adjustments, the Stored Value date itself (Source) with potential adjustments or both. Where the less than operator (<) is selected from the highlighted area. Choose the operator for your query. Set the target date (this could be the current date or a fixed, static date. 1. Adjustments may be made to either the Target Date, Source Date or both. 2. Set your adjustments on the relevant tabs. These may be negative adjustments by applying a minus (-) sign. For positive adjustments there is no need for a plus (+) sign. All adjustments may be applied by using Stored Values. Select the 'Text' data type. Enter the text to search for. Select the 'Number' data type. Enter the number to query against.